Its been quite some time since a last entry! I'd love to be able to say that I've been utterly bone idle and have been lazing around, but unfortunately not the case. Decorating my new studio from the floor up has been the main task at hand. Little did I know how much of a DIY iceberg it would turn out to be. I thought it would just be a quick lick of paint after stripping off the old anaglypta wallpaper and that would be it, but alas the best laid plans evaporated into a red mist of frustration. Just a few of the issues that required attention: All lighting replaced. The wall sized window / door needed re-fitting to make water tight as it was completely bodged when it was installed. A new radiator fitted as the old one leaked. The floor needed leveling. And then for fun we found that the drains under the studio and garage were blocked and had been backing up from the main drain for about a year :-( On the day it was cleared you can only imagine at that whole new level of nasty that was encountered underground. 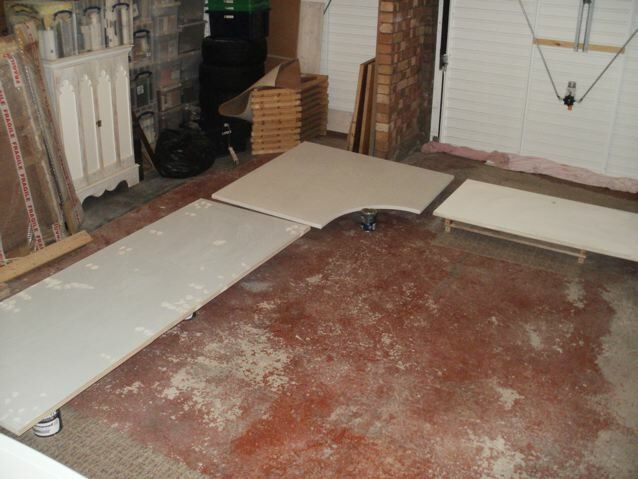 So once all that lot was put right, I set to with a circular saw, some 25mm thick MDF and gallons of white paint. A couple of weeks later new desk tops and shelves were installed. One paint area (drawing board) and two computer desk areas. One for illustration work and one for when Su occasionally works from home. The studio finally went live about two weeks ago, leaving a make shift studio in the corner of the dinning room, juggling commissions around while setting up shop. The light is great as its north facing and even though its smaller by about 40cm each way than my old work room, being a simple cube it works more efficiently as a space. A lot easier for laying kit out - no chimney breast or nooks and crannies to work around. After shots show the just moved in look. Unfortunately its not that tidy now! Nice to finally unpack the James Jarvis King Ken sentinels so that they can take pride of place on the top shelf!